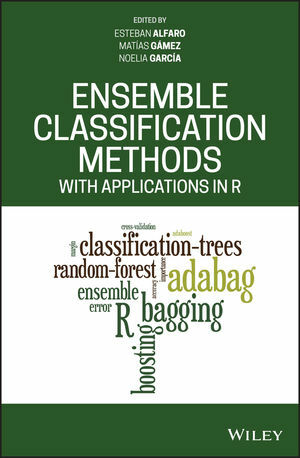 Ensemble Classification Methods with Applications in R introduces the concepts and principles of ensemble classifiers methods and includes a review of the most commonly used techniques. This important resource shows how ensemble classification has become an extension of the individual classifiers. The text puts the emphasis on two areas of machine learning: classification trees and ensemble learning. The authors explore ensemble classification methods’ basic characteristics and explain the types of problems that can emerge in its application. Written for researchers from many fields such as biostatistics, economics, environment, zoology, as well as students of data mining and machine learning, Ensemble Classification Methods with Applications in R puts the focus on two topics in machine learning: classification trees and ensemble learning. ESTEBAN ALFARO, MATÍAS GÁMEZ AND NOELIA GARCÍA are Associate Professors at the Applied Economics Department (Statistics), Faculty of Economics and Business of Albacete, and researchers at the Regional Development Institute (IDR), University of Castilla-La Mancha. Together they have published several papers in prestigious journals on topics such as applications of ensemble trees to corporate bankruptcy, credit scoring and statistical quality control with the most notable in Journal of Statistical Software, Vol 54.